This morning I got up just before 10am. It’s not too early and not too late for a Saturday morning. I can still get a lot achieved if I don’t procrastinate too much and I am well rested to achieve it after a busy week teaching. I always set myself ambitious writing targets for the weekend. If I don’t write a whole article every weekend, I at least have to get a lot of reading done for an upcoming article. A few weeks ago a friend of mine moved in with me for the winter, and now that I have a roommate I feel compelled to engage more in that other favourite hobby of mine besides writing and that is: cooking. I joyfully announced to my lovely roommate this morning that I was going to make us waffles with mixed berries, vanilla and maple syrup. She did not object. After enjoying a delicious feast and a couple cups of coffee I finally sat down at my desk to work. No sooner had I sat down, I felt irritated. There are many different articles and reviews I intend to write over the next few weeks and the question was: Where do I start? Which one am I in the mood for writing? Which one is actually ready to be written? Which one have I gathered enough material for in order to even strike and begin writing? These and other questions flew through my skull. I did what I do when I am overwhelmed: I procrastinated and started on none of them. Instead I read articles about creativity and procrastination in the hopes that this act would heighten my creativity and end my procrastination. ‘Well, there is the connection!’ I thought. This passage reminds me of two things. The restaurant review I am supposed to be writing today on an Alice in Wonderland themed meal I went to a few weeks ago on a press pass and: food. The passage reminded me of how delicious those berry waffles were, and of course that I have some ice-cream in my freezer that I can reward myself with after I have actually achieved something and stopped procrastinating. Thanks Maya Angelou! I then remembered that it was also Maya Angelou who said the following: ‘You can’t use up creativity, the more you use, the more you have.’ Ok, fine, fair enough. But I am still waiting for inspiration to strike today. I grabbed another book. ‘The Pale King’ by David Foster Wallace. I flung it open too, to a random page and I read the following passage: ‘For those who have never experienced a sunrise in the rural Midwest, it is roughly as soft and romantic as someone’s abruptly hitting the lights in a dark room. This is because the land is so flat that there is nothing to impede or gradualize the sun’s appearance. It is just all of a sudden.’ This passage reminded me immediately of the inspiration I got when I went to the Mies van Der Rohe Haus earlier this year and saw an exhibit by American artist Max Cole who grew up on the Kansas Plains. Her artwork is full of horizontal lines, bands and stripes that she says are a product of the flat environment she lived in. David Foster Wallace’s writing and life in general was also influenced by the vast Midwest landscape. He excelled at tennis and trigonometry which also demand one’s being comfortable with harsh, horizontal lines. I remember how I came home that day and immediately and effortlessly wrote the article about the exhibit I saw there. It just flowed out of me. That is when writing is the most pleasurable and fun. There was no procrastination that day. About a month ago I had a similar experience. I went to an exhibition at Haus am Lützowplatz entitled ‘The Living Dead’. I interviewed some of the exhibiting artists, the curator of the show and the artistic director of the gallery. I had intended to write a funny article about death and Halloween and the exhibit. There was one crazy image in the exhibit and a friend of mine said ‘Is that a zucchini casket?’ I looked at the image closer and realized the hilarity of this remark. Indeed. 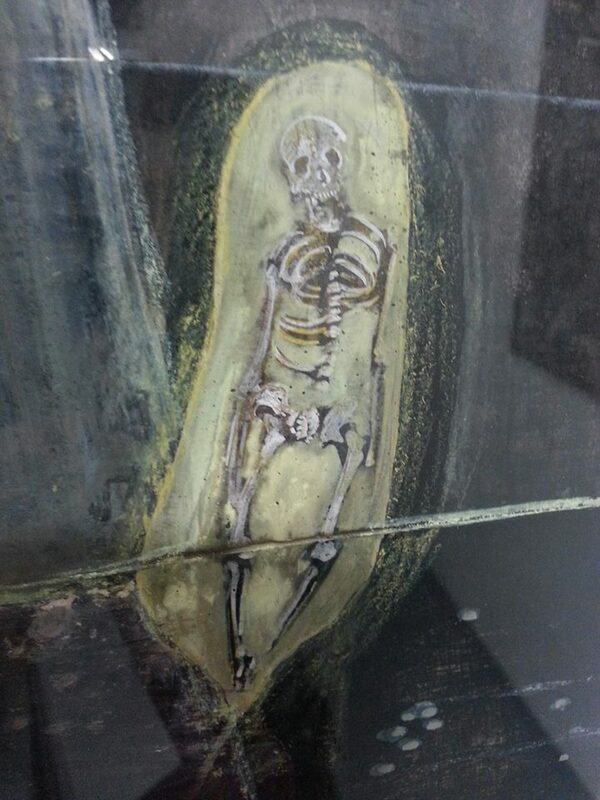 It looked like a zucchini with a skeleton in it. This was definitely more fuel for me to write a crazy article about ‘The Living Dead’ Expo but then, only two days later, I received the incredibly sad news that a childhood friend from home in Ireland had died in a car accident. He was a wonderfully talented musician and this was a huge tragedy for our small community. The tributes to him started flowing in on Facebook and everyone was united in mourning the tragic loss of such a beautiful soul. Naturally, out of respect, I abandoned my funny article about death. I also abandoned my restaurant review. While many people were sad and mourning I did not feel like posting an article about an Alice in Wonderland themed meal either. Today, after much procrastination, I finally wrote the restaurant review. I also ate a delicious vegetable soup that contained a lot of zucchini to help fuel my writing. The review of the expo ‘The Living Dead’ will never be written and that is fine. I have moved onto new projects. Creativity and motivation flows in mysterious ways, but Maya Angelou has a point: ‘You can’t use up creativity. The more you use, the more you have.’ We just can’t always control which direction it will take. The best I can do is be aware of what is blocking me and take conscious steps to get the creativity flowing again. In this dark November I can also keep myself well fed with tureens of soup and ice cream. My lovely roommate has just returned the favour of the berry waffles and zucchini soup by bringing a huge bar of chocolate to me at my writing desk. It is after midnight and I am still writing. This has been a productive day after all. When I joined my family and old friends back at our table in the café 5 minutes later they were already playing guitar and singing an old Beach Boys song. The rest of the customers and the wait staff were singing along and smiling too. ‘This is so California’ I thought to myself. When I opened the menu the first item my eyes fell on was ‘spacadillas’ which of course is a play on the word quesadilla. 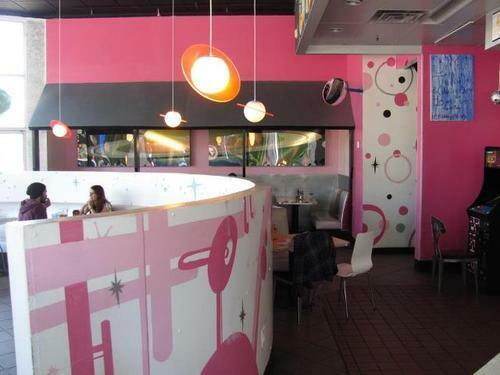 Saturn Café, in downtown Santa Cruz, has a Jetsons like space décor and round lamps with rings around them to resemble Saturn. It is truly a delightful space to dine in. Funky artwork adorns the walls, the building is round with American style diner booths artfully crafted to fit the building’s shape. The food is exquisite. It is all vegetarian using locally sourced organic produce. The owners are dedicated to sustainability and serving happy people healthy soul food. They have kept apace with the growing demand for a healthy twist on American comfort food. Their vegetarian burger is a big hit and they cook their fries in trans-fat free oil that then gets turned into bio fuel. They have won numerous awards for their excellent food which includes organic soups, healthy scrumptious salads, vegan milkshakes and delicious breakfast burritos. I dined on the most fantastic fresh tomato soup with dill, perfectly ripe avocadoes and freshly squeezed lemonade. And one refreshingly pleasing aspect was that the portions were not enormous, which is the case in so many American restaurants. If you are dedicated to sustainability in American dining, the first easy step you can take as a restaurant owner is to half the portion size!! (I don’t usually use exclamation points in my writing as I know it is bad style, but I think a couple are necessary here). Perfectly sated and happy, We headed to the sunny beach with the guitar to digest our delicious meal in the warm breeze and while watching the waves crash the coast we all sang along to old Beatles songs. A perfect Santa Cruz afternoon, and a happy reunion of friends and family.